When I was little my mom always served this combination at dinner, particularly when we were eating Indian food. Since Indian food always has a mad amount of masala going on, something cool and refreshing provides the perfect balance. For children, it’s also like having a little dessert along with dinner (which I remember as feeling pretty special, like I was getting away with something). The recipe is super simple. 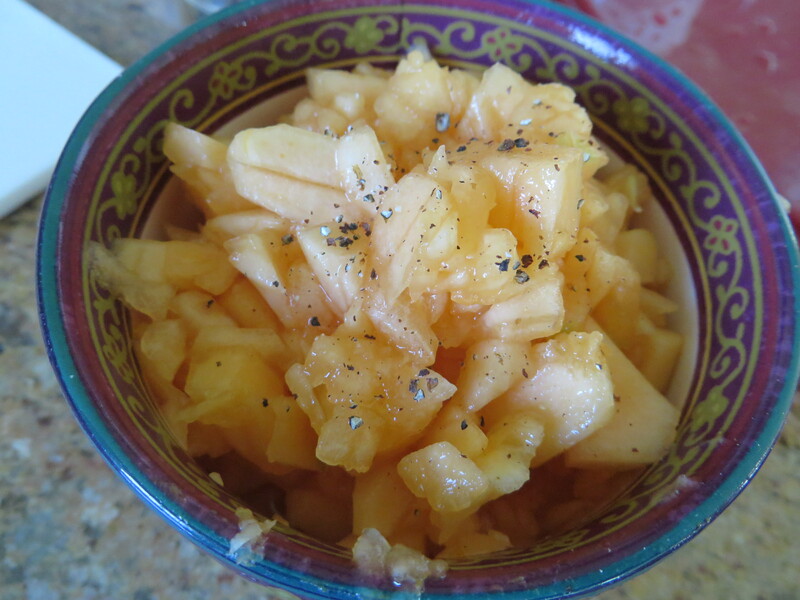 Simply mince some cantaloupe and stir in a pinch of ground cardamom and a pinch of sugar (you can omit this if your cantaloupe is particularly sweet). The key to this dish is the way you cut the melon–mincing it allows the juices to accumulate, which when combined with the cardamom makes for tasty sips at the bottom of the bowl. The other key to this dish is serving it well-chilled. Refrigerate for 15-30 minutes before serving. The juices will have enough time to accumulate and the cold enhances the summery taste of the dish. Puree for very small babies, serve as is for toddlers and kids. What a great way to introduce a new spice!